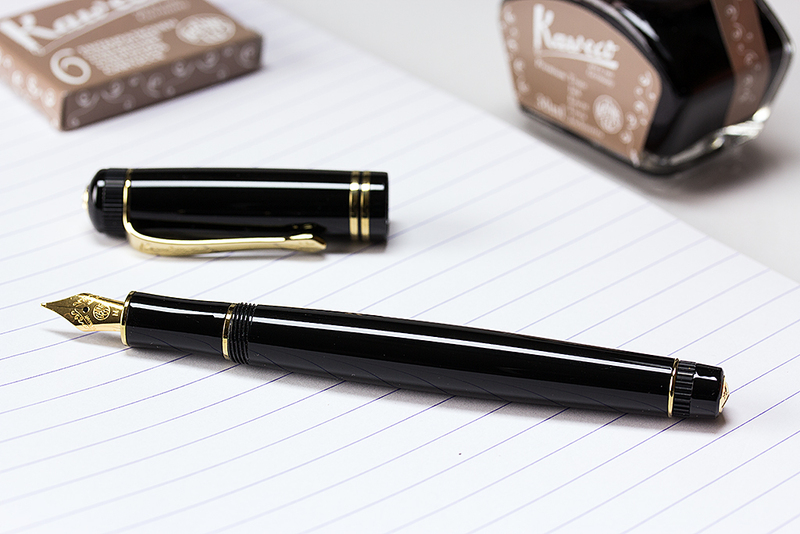 Kaweco DIA2 Fountain Pen | Knight's Writing Co.
Kaweco is a well known pen manufacturer based in Nürnberg, Germany who produce all manner of writing instruments from fountain pens, ball points and roller balls through to pencils. 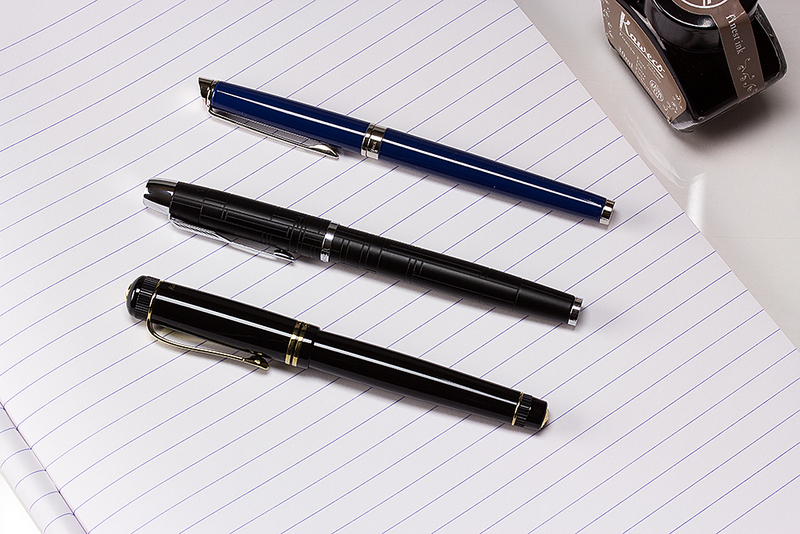 Their slick and quirky Sport series are a popular fountain pen for a first time buyer or for those who want a conveniently packaged and cool looking pen for carrying around in a pocket. 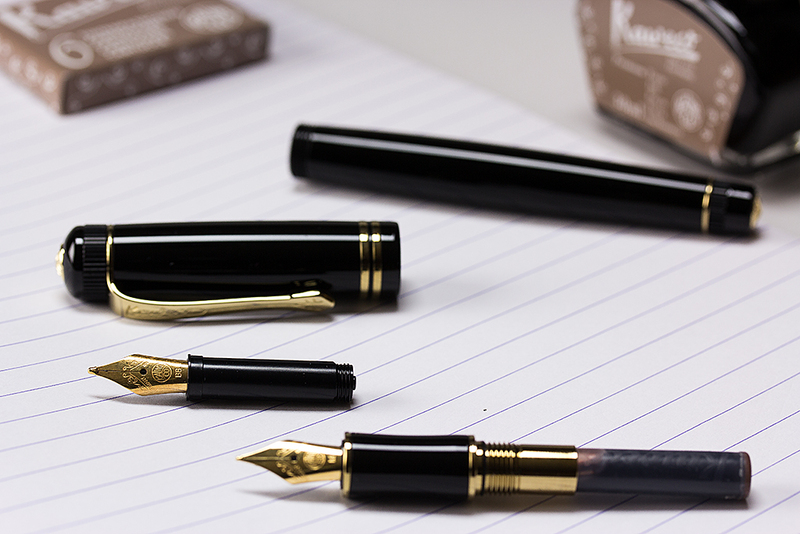 When you buy a Kaweco pen, you can be sure that you are purchasing from a company with a long history and a passion for their work. The DIA2 is a pen that could easily be overshadowed by Kaweco’s wide range of products. But this traditional style pen is a truly special rendering of a 1930s original. The DIA2 is vintage in styling but with a definite modern feel. When I used the pen for the first time I felt guilty that I wasn’t wearing my tweeds and puffing on a large pipe after a day shooting grouse. The pen has character in spades. The gold trim and brass clip glisten beautifully and the lacquered barrel shines brightly even after hours of use. Finger smudges don’t seem to be a problem but if you do have sticky digits, a swift wipe with soft cloth will bring the pen back to its former glory. The lines of the DIA2 are really interesting. The convex barrel sweeps subtly toward a slightly concave front end making the pen very comfortable to hold. One slick feature is the fast thread used for screwing the cap in place. It only takes a little turning to securely anchor the cap. The knurlings on each end of the pen are simple yet sublime and combined with the gold trimmed Kaweco stamp adorning the tips, turns an ordinary ‘end’ into a work of art. 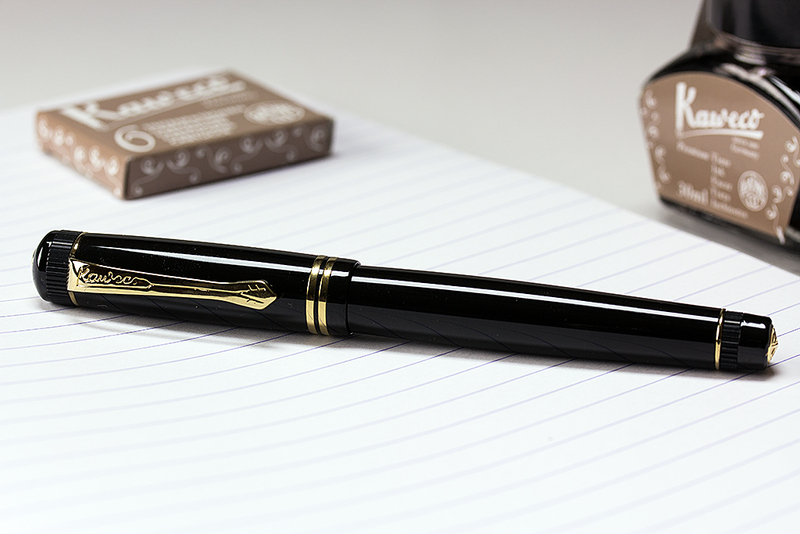 With a classy Kaweco logo printed on the reverse of the cap, the pen feels like a lot of love has gone into its design. Kaweco uses the same nib design and quality on all of its higher end pens. The gold plated nib with screw-in mount can easily be changed for an extra fine, fine, medium, broad, or double broad. One might initially feel a little cheated that you don’t have a special nib for this special pen but unless you have a lemon, Kaweco nibs are great quality. The nib is nice to write with although much like a luxury car, it might need a little mileage to break in. The initial post-manufacture stiffness seemed to disappear quickly and the engine seemed to open up and bring more pleasure over a short time writing. The medium nib used in this review was extremely smooth and had great ink flow when fitted with a Kaweco sepia cartridge. Size-wise the pen is no cigar (here compared to a Parker IM and Waterman Hemisphere). And it’s no Liluput, Kaweco's tiny tube-pen. The DIA2 is a good size for both large and small hands alike. It's a solid feeling pen, but not overly heavy. A nice feature of the DIA2 is a small spring in the end of the pen that stops your spare cartridge getting accidentally wedged and impossible to remove without tweezers. The pen takes international cartridges or a converter so you can use your favorite bottled ink. 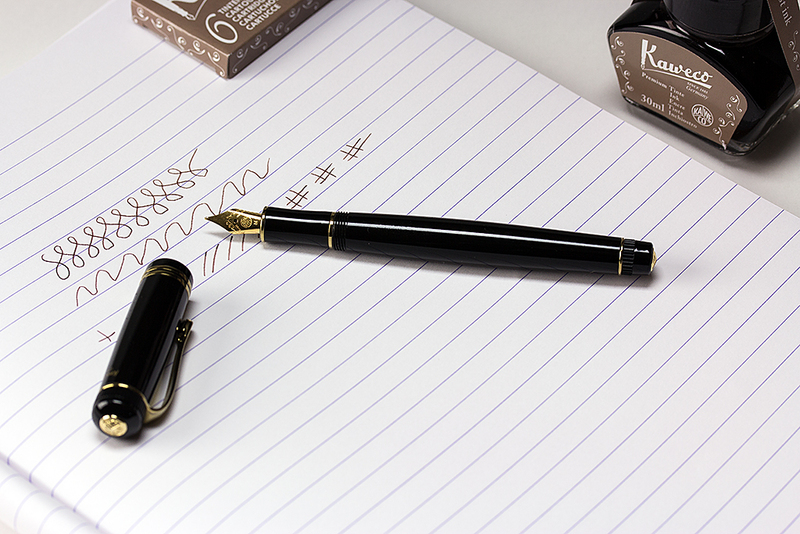 The DIA2 shows Kaweco as a solid manufacturer of high quality fountain pens. It’s easy to forget the company’s long history and beautiful products when you pick up a Sport Classic, a fun pen that you can throw around any which-way! But when you pick up the DIA2 it’s obvious that Kaweco have both craft and class as well as a huge passion for the pens that they make. The DIA2 comes in a lovely gift box. It oozes pride and workmanship and is a lovely pen to use. Find it at Knight's Writing Company.